Summary: After trained examiners and accomplished business professionals performed a thorough assessment of this work, John Toussaint, MD, has been selected as recipient of an internationally recognized award from the Shingo Institute, part of the Jon M. Huntsman School of Business. The author will receive the award at the 28th International Shingo Conference occurring April 25-29, 2016 in Washington DC. LOGAN, Utah — The Shingo Institute, part of the Jon M. Huntsman School of Business at Utah State University, has awarded Dr. John Toussaint with the Shingo Research and Professional Publication Award for his book, “Management on the Mend: The Healthcare Executive Guide to System Transformation.” Toussaint is CEO at ThedaCare Center for Healthcare Value. 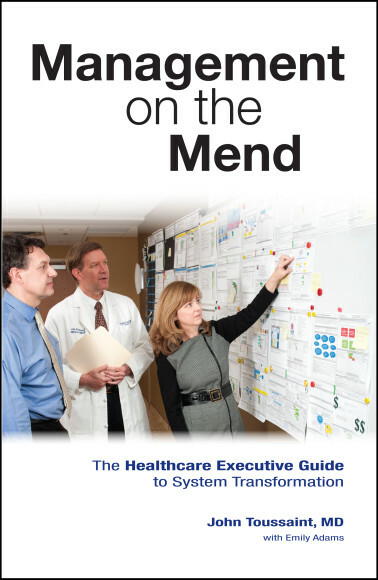 “Management on the Mend” is the result of years of investigations by Dr. Toussaint of dozens of healthcare organizations around the world. Using their collective experiences, he has built a model for lean transformations that work. This book describes the model, step-by-step, through people in 11 organizations who are doing the work. It is the story of many journeys and one conclusion: lean healthcare is not only possible, it is necessary. As senior leaders look ahead to a future that includes radical changes that include population health management, the healthcare payment system, and patient expectations, everyone knows that health systems must be agile to survive. In order to thrive, they must be able to continuously improve. “Management on the Mend” is the roadmap for that future. Rick Wartzman, executive director of the Drucker Institute and Fortune columnist, says, “’Management on the Mend’ is a supremely well-written, fast-moving, example-filled guide to transforming healthcare organizations. But the truth is the book should be required reading for any executive trying to radically improve the way his or her company operates. John Toussaint’s lessons are so cogent and so powerful they transcend any one field. ”By “challenging” or applying for an award, authors invite a group of accomplished professionals and trained examiners from the Shingo Institute to thoroughly review their publications. Shingo examiners select recipients based on a rigorous set of standards. Toussaint will receive the award during the Awards Gala of the 28th International Shingo Conference in Washington D.C. The conference is a five-day event featuring a selection of workshops, plant tours, keynote speakers and breakout sessions designed to provide ongoing knowledge, insights and experience for organizations in pursuit of operational excellence.